As the fall semester races to the finish, Emory's calendar remains packed with inexpensive events that are both entertaining and educational. Here are 10 things to do for under $10 this month. Even better, most of these events are free! 1. Welcome the First Folio to campus with a full slate of Shakespeare events. Emory is the only site in Georgia where you can see the First Folio, the first collected edition of William Shakespeare's plays, as it tours the country in honor of the 400th anniversary of the playwright's death. "First Folio: The Book that Gave Us Shakespeare" will be on display Nov. 5 through Dec. 11 at the Michael C. Carlos Museum; admission is free for Emory students, faculty and staff. Shakespeare at Emory hosts a full slate of events in conjunction with the exhibit, including the official opening celebration, " Will of the People: Shakespeare's Folios and Their Meaning in Our World," on Nov. 10 and the official closing celebration, "The Bard and Poetry," on Dec. 10. View the full schedule. 2. Celebrate 30 years of work on the letters of Samuel Beckett. Shakespeare isn't the only literary legend being celebrated at Emory this month, as Laney Graduate School and the Letters of Samuel Beckett Project mark the publication of “The Letters of Samuel Beckett, 1966-1989” by Cambridge University Press — the culmination of almost 30 years of work to bring the acclaimed writer's correspondence to the world. Campus events include "Samuel Beckett's Life and Work: An Exhibition," an exhibit on display in Dobbs University Center Commons through Nov. 5; "Engagement in the Arts: Samuel Beckett in Prison," featuring Lois Overbeck and Alan Mandell discussing "Waiting for Godot" in San Quentin and The San Quentin Drama Workshop, on Nov. 3 at 4 p.m. in White Hall, Room 206; "Connecting Contexts: The Letters of Samuel Beckett 1929-1989," an exhibit opening Nov. 3 and continuing until Jan. 13 in the Stuart A. Rose Manuscript, Archives and Rare Book Library; and "Words Fail So Simply Much Love," a celebration on Nov. 5 at 7:30 in Glenn Memorial Auditorium that features readings and musical interludes. All are free to attend. 3. Ponder "Music for Airports" and the nature of ambient music. Brian Eno's "Music for Airports" is a paradigmatic piece of ambient music, giving the genre its name and blurring the distinction between high and low art. This free, four-evening seminar at the Fox Center for Humanistic Inquiry features close listening and consideration of Eno's album, plus readings from Eno, Steve Reich and John Cage. The seminar meets Nov. 7, 14, 21 and 29 from 7 p.m. to 9 p.m.; email or call 404-727-6424 to reserve seating in advance. 4. The morning after the election, examine "Diversity, Demographics and the Age of Donald Trump." On Nov. 9, the day after the election, Pulitzer Prize-winning syndicated columnist and former editorial editor of the Atlanta Journal-Constitution Cynthia Tucker Haynes discusses "Diversity, Demographics and the Age of Donald Trump" as part of Candler School of Theology's "Faith and Politics in the 21st Century" lecture series. The free discussion takes place at 11 a.m. in Room 252 of Candler's Rita Anne Rollins Building. Register here. 5. Show your respect at the Veterans Day flag ceremony. Join the Emory Veterans Association for the annual Veterans Day Ceremony on Friday, Nov. 11, at 11 a.m. on the Quad. The free ceremony includes guest speaker Jon Keen, a veteran of the War on Terror and graduate of Goizueta Business School. Learn more about veterans at Emory. 6. Experience CultureSHOCK — in the best possible ways. Hosted by the Emory College Council, CultureSHOCK is an annual celebration to showcase unique identities on campus as well as overall unity within the Emory community. This year's event — "8,000 Stories, One Emory" — is set for 6 p.m. to 8:30 p.m. on Friday, Nov. 11, in the WHSCAB Auditorium, with new Emory President Claire E. Sterk as the keynote speaker. The free celebration includes student performances, speakers, art and cuisine. 7. Give back to your community to let people know Emory Cares. This year's Emory Cares International Service Day is Saturday, Nov. 12, offering dozens of ways to get involved to help your community. A partnership between the Emory Alumni Association (EAA) and Volunteer Emory, the annual event unites hundreds of students, alumni, staff, faculty, family members and friends in a day of volunteering. Sign up here for EAA projects in Atlanta and 50 other locations around the world; sign up here for Volunteer Emory projects in the Atlanta area. 8. Cheer on the Emory Eagles as basketball season gets underway. Hoops season starts this month with both the women's and men's teams returning to the court. The women's team takes on Oglethorpe here on Nov. 15 at 6 p.m. The Emory men's team has their first game in Atlanta at the Oglethorpe Thanksgiving Classic on Nov. 26 at 3 p.m. against LaGrange. Emory home games at the Woodruff PE Center are free. 9. Explore Tibetan identity through the works of artist Gonkar Gyatso. Don't limit your visit to Carlos Museum to just the First Folio. Take advantage of free admission for Emory students, staff and faculty to explore “Family Album: New Works by Gonkar Gyatso in Collaboration with Photographer Zhadui,” which closes Nov. 27. Gyatso, a Tibetan-born British artist, explores contemporary Tibetan identity through a series of large-scale photographs depicting members of a single family living in Lhasa. Inspired by the proliferation of photographic media, including fashion photography, “Family Album” investigates changing representations of Tibetan-ness in an increasingly interconnected, globalized world. 10. Stock up for Thanksgiving – or lunch – at the Emory Farmers Market. 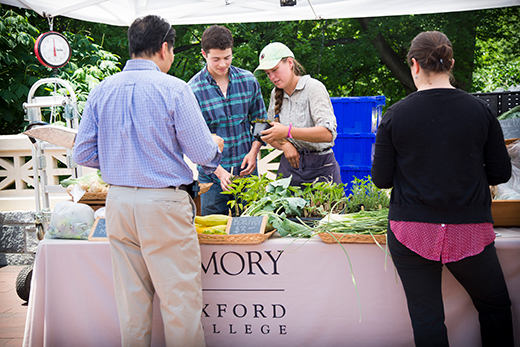 Held on Tuesdays from 11 a.m. until 3 p.m. at the Cox Hall Bridge, the Emory Farmers Market offers a variety of tasty treats, from local produce grown at the Oxford College Farm to a variety of other organic items. Pick up unique items for your Thanksgiving feast, and also remember that many vendors offer prepared items — you can grab a quick, healthy lunch, or treat yourself to a popsicle from King of Pops. Many items are available for less than $10.